MySQL to MS Excel Database Converter is professional and simple application designed to convert MySQL data base records into MS Excel data base file format. The advanced database converting wizard has fast processing and quickly converts bulk MySQL database records into MS Excel database within limited time period. Software supports conversion of entire or selected MySQL records into MS Excel format accurately without altering source data base files. Award-winning database file converter program easily supports key constraints, data types, attributes, tables (including rows and columns) etc while converting MySQL database records. No scripting, complex database coding or any table designing is required to convert the database records. Streamlined graphical interface helps to easily understanding the software and facilitates business organizations or IT professionals to generate database in MS Excel worksheets. Advanced database converter software is economical, easy to operate and runs on all Microsoft Windows OS platform that supports MySQL server. Instantly converts database records of MySQL to MS Excel spreadsheet with full accuracy. Supports full functionality and structure of the existing MySQL database files during conversion. Supports all database constraints, tables, rows, columns, while database conversion process. Allow user to save converted database records at specified location on the system. 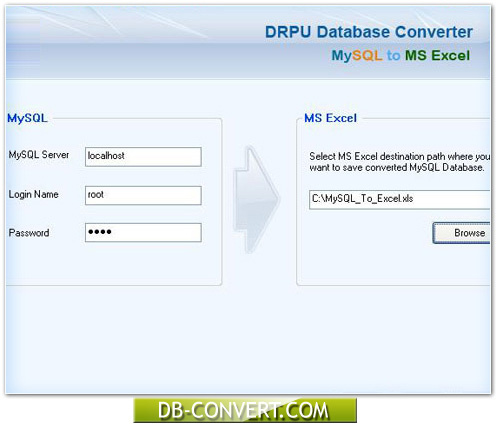 Automatically convert MySQL database records into MS Excel without any scripting or database coding. Facility to convert either whole database or selected database table records in minimal time. Saves time and money while converting MySQL database records into MS Excel work sheets. Support all major versions of MySQL server database. Widely used by IT professionals or in schools, colleges and business organizations for quickly creating simple Excel database sheets. Friendly GUI interface and no technical skills are needed to operate the software.